This was the first batch after my summer brewing hiatus came to an end. I was intending to make a beer similar to a fantastic Brown Porter I had at the BURP Real Ale Fest last fall. 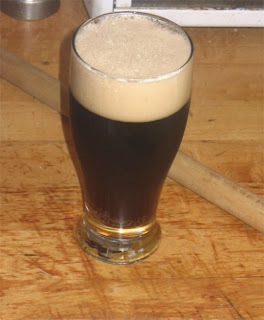 The beer came out fine, but I was too light handed with the dark malt to get the color and flavor I was after. The recipe is pretty straight forward, except for the Carafa Special. I used this dehusked German malt instead of American/English Chocolate malt to make the beer extra smooth. Tasting the results though I now realize that I should have used closer to .5 lbs instead of .25 lbs. A beer that starts at 1.045 can finish too dry pretty easily which would reduce the drinkability (which this beer is all about). To counter this the recipe was built to leave a good deal of residual sweetness with a solid amount of crystal malt and a pretty high mash temp (155).The sole dose of hops was added near middle of the boil (40 min) just to let a little more hop character come through than a standard 60 minute bittering addition. The fermentation temperature was held pretty low (60 ambient) to make sure the yeast didn't become too estery. English beer is all about balance, no single character should dominate over any other. Appearance – Medium brown in the glass, but clear amber/red when held up to the light. Great tight off-white head, with good retention. The head leaves pretty good lacing as well. Smell – Slight herbal hop note at first, but it soon gives way to fresh toast and a faint whiff of chocolate. As the beer warms I can really smell the Marris Otter basemalt, the aroma reminds me of grinding malt at the start of the brewday. Taste – Lightly toasty with a slight fruity (cherry?) note in the finish. Slightly minerally character. Not much in the way of real “dark” malt character, which is fine for a brown ale, but not really what I was aiming for. It is very balanced though, although I think it could stand another 5 IBUs to balance the residual sweetness. Mouthfeel – Slightly creamy medium body with restrained carbonation. The carbonation is just what I was aiming for, very cask like. Drinkability & Notes – The moderate carbonation and balance make this one very quaffable. I like the yeast character of this more that my last couple dark English beers, the mineral and ester characters are there, but just as compliments to the bready malt backbone. 1.00 oz. Willamette @ 40 min. 0.25 Tsp Yeast Nutrient @ 15 Min. No water adjustments (filtered DC tap water). Runoff was a bit slow due to compacting. Collected 5.5 gallons of 1.032 runnings. Did not skim wort at start of boil as usual. Year old hops adjusted down from 5.8% AA. Chilled to 74 degrees. Inflated yeast pack pitched after the wort spent 2 hours in 60 degree freezer. Freezer then adjusted to 63 degrees. Fermentation took 24 hours to get started. 10/08/08 Fermentation looks about finished, boosted temp to 66 to make sure it finishes. 10/12/08 Down to 1.013 (71% AA, 4.2% ABV), good toasty flavor. Not as much chocolate as I wanted. 10/18/08 Bottled with 1 3/8 oz of cane sugar. 11/09/08 Good, but more like a brown ale than a brown porter. Brown malt is very nice indeed in a porter, but I find darker malts are essential to bump up the roasted aspect.